The opening game of #FIFAWC2014 had been initiated in Sao Paolo, on 12 June 2014 (13 June 2014 in Jakarta) with a victory of the host nation Brazil over the Balkan contender Croatia. Neither is my fav team. The score was 3-1. All 4 goals were scored by Brazilian. 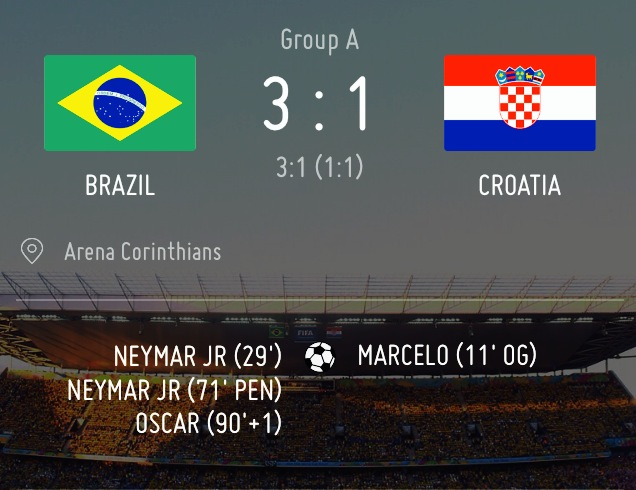 Marcelo (BRA) “scored” own goal in 11′, Neymar (BRA) 29′ and 71′ (penalty) and Oscar concluded the game with his goal on 90’+1′. Marcelo (BRA) own goal in 29′ remarked as the first ever the Yellow-Blue team conceded in their history. It was also the first ever own goal that opens the world cup in all edition. Neymar (BRA) was voted as the Man of the match, who scored twice in this game. Played with a composition of 4-2-3-1, Brazil with strong World Cup tradition possessed the majority of the game with 58% ball possession. There were total of 24 shots, 13 of them were on goals, but none of corner kick was given during 90 minutes. The games was coloured with 4 yellows from total of 26 fouls.